Pratique 35 steel multi-chine cruiser "Salty Dog II"
Pratique 35 prototype "Salty Dog II"
The Pratique 35 is a boat of fairly traditional styling, with a conservative underbody and great strength. She is a good choice for those wanting a go-anywhere boat that will give reasonable passage times and they can build for themselves. Moderate draft will also get her into most canal systems, making her a versatile long distance cruiser. CNC cutting files are available for all steel panels for the multi-chine version of this design, including the assembly frame. Order on our pricelist. Pratique 35 kit build from cutting files. The prototype is "SALTY DOG II" which had done 3 Atlantic and 2 Pacific crossings and extensively cruised the West Coast of Norht America, from British Columbia to Mexico, where she is currently located. She has proven to be a very comfortable cruising boat and has logged up some good passage times for her type. She was first drawn for the reasonably skilled amateur builder, with robust construction steel hull and either timber or steel deck. Frames are widely spaced with stringers giving support to hull plating at closer centres, so enabling the builder to more easily build a fair hull. A new option was added in May'98, for either steel or aluminum radius chine construction. The underwater profile looks a little unconventional for steel construction but is simply a long shallow keel with fin keel and skeg below and is of simple construction. Ballast is all in the fin keel. For construction with the steel deck, a 100mm deeper fin keel and skeg are used to lower the CG of the ballast to counteract the deck weight. The interior arrangement provides a comfortable permanent home at sea or in port for a couple or small family while having additional berths for guests if required. The aft settee is a comfortable watch position while sailing under self-steering, can be used as a single quarter berth or converts to a double by using the backrest as an infill panel. The double forward berth has a lee cloth on centreline but other berths further aft will be more comfortable in rough weather. Seperate sail stowage has been provided in the most uncomfortable part of the boat, giving more valuable space to better use. The head, galley and navigation areas have all been positioned to be in areas of relatively low movement in the boat so as to ease life at sea and minimise the necessity of going forward in bad weather, all living functions being catered for in the afterpart of the boat. The rectangular bowl/hatch in the galley worktop is a standard plastic basin which lifts out to give access to the locker below and provides secure stowage to loose galley items while sailing. Full headroom over the main circulation areas is provided by extending the deckhouse to beyond the point of entry to the dinette. Forward of that, headroom is restricted in the interest of a clean deck and acceptable freeboard. Clean decks combined with a cutter rig and a wide variety of reefing options make her an easily handled boat for a couple. Her underwater profile makes her directionally stable for self-steering yet manoeuvrable and she has the capability of standing on her keel and skeg to lean against a dock without falling on her nose. Her moderately heavy displacement makes her comfortable at sea while her freeboard keeps her dry on deck. In all areas she is a comfortable, safe and capable long distance cruiser, with go-anywhere capability. Testimonial from Brian Alcock, Cape Town, South Africa. My first client, he commissioned "Salty Dog II", prototype of the PRATIQUE 35, of which he writes below. He later became a professional steel boatbuilder and commissioned another 5 designs over the years. He has built 22 yachts to my designs to date. "The entire project from the time of our first discussions has been immensely satisfying, and this has been enhanced by your close cooperation and excellent drawings which leave absolutely nothing to be desired." "The boat showed that she was well balanced, very powerful to windward with, I thought, just the right amount of buoyancy in the bows to minimise pounding and keep the spray from her crew - she is stiff enough to drive through rough conditions and yet be comfortable. Both on and off the wind she shows an excellent turn of speed." Follow these links to print or download a material list for the steel hull and deck structure, a stability curve or a list of drawings. 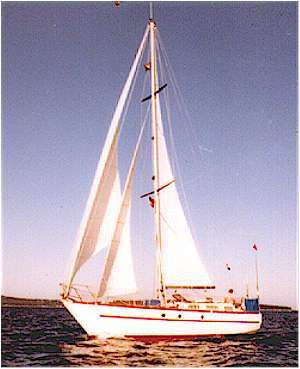 Stewart and Sallyanne Calver - Current owners of the steel Pratique 35 prototype "Salty Dog II", now named "Jekamanzi", had this to say about her. "On our initial sail out from Victoria to San francisco in September of 1996 we spent 4 of the 6 day trip in a 45 knot gale and 25 foot seas and without the windwave self-steering I am not sure we would have survived the trip. We never once took any seas on board as we sat strapped into the cockpit totally in awe of these 25 feet seas as we surfed down the swells as they swept past us night and day. After four days of this we reached San Francisco totally exhausted physically but the boat was dry and unhurt. I know I could not have steered as well and being so tired I am sure we would have broached had we been hand steering. That windwave pilot and the vessel herself are a marvel. During that storm two other boats were lost with all hands and others suffered broken booms and rigging and torn sails." She is now also available in radius chine form for construction in either steel or aluminum. Sailing characteristics will be fairly similar to the multichine version but she will have improved resale value. 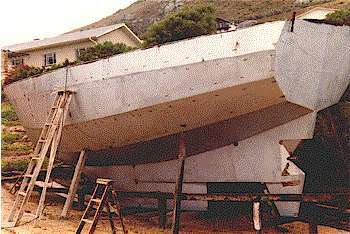 Construction in steel is still suitable for amateur builders but the results will look close to those of a professionally built round bilge hull. The aluminum version has an extra 390kg (860lb) of ballast and puts the rest of the weight saving into extra load capacity. This version was commissioned by Mr Wolfgang Mack of Germany, to be built in his home country.